I don't know about you, but...I have to work on an SLO and PPG. For my PPG...proving that what I am doing is data driven and proven to improve all test scores...realistic??? Maybe, not, but I am going to die trying. My professional goal is to increase my students' vocabulary to increase knowledge...and hopefully their test scores. I am starting with a few grades...first my fifth graders. 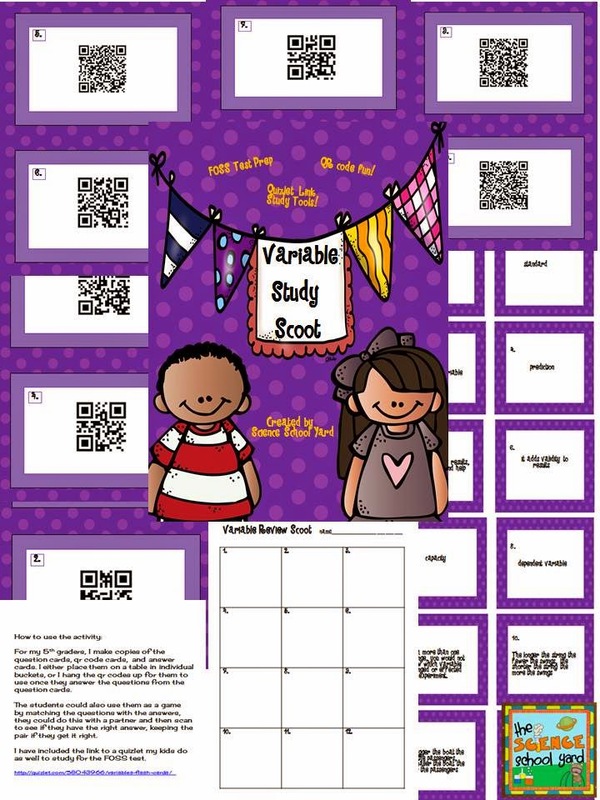 We are finishing up on our variable FOSS unit so I created a quizlet...check it out for your students by clicking on the link! I am also creating vocabulary question cards based on vocabulary and questions for our FOSS assessment. We then are graphing our progress. These activities are being used with our before school and after school homework help program. I sure hope I see growth. I have also been using google forms and flubaroo to grade the formative tests I am giving. It grades the tests within a minute and prints out percentages, graphs, and color codes it. Great for my SLO or student learning objective. After 23 years, more hoops, but with vocabulary building...hopefully come success. Here is my vocabulary activity my kids have in their 5th grade classrooms. They seem to be getting it and its fun with QR codes! I can't wait to see how it helps their test scores. We shall see next week! In the meantime, stop on by my store and check out this and other products at The Science School Yard TPT Store.